July 3, 2012 - In what officials describe as "a prudent measure," all military C-130 aircraft equipped with the Modular Airborne Fire Fighting System have been placed on operational hold after one of the aircraft crashed Sunday, July 1. A MAFFS-equipped C-130 from the North Carolina Air National Guard's 145th Airlift Wing crashed while battling a fire in southwestern South Dakota at about 6:30 p.m. Mountain time Sunday, officials said. "There were casualties, and our thoughts and prayers go out to those who were injured and those who lost their lives," U.S. Northern Command officials said in a written statement today. "The family members of these airmen are especially on our minds. We will provide further details on the status of the casualties soon." The cause of the crash has not been determined, and the incident is under investigation, officials said. At the time of the crash, the crew was fighting the White Draw Fire near Edgemont, S.D. Sunday's crash was the first in the 40-year history of the MAFFS program, a joint Defense Department and U.S. Forest Service program that provides additional aerial firefighting resources when commercial and private air tankers are no longer able to meet the Forest Service's needs. MAFFS is a self-contained aerial firefighting system owned by the Forest Service that can discharge 3,000 gallons of water or fire retardant in less than five seconds, covering an area a quarter of a mile long by 100 feet wide. The MAFFS-equipped fleet is spending Monday getting the crews together to "reflect, reset and review," said Air Force Col. Jerry Champlin, 153rd Air Expeditionary Group commander. "We all need to make sure our crews and planes will be ready to re-engage in the mission safely." U.S. Forest Service Chief Tom Tidwell said the agency is deeply saddened by this tragic incident. "The agency fully supports the decision by the military to stand down its MAFFS operation to address the needs of personnel and families and ensure the safety of the mission when it resumes," he said. "The agency will continue to allocate available firefighting assets according to the prioritization of incidents." It is not known when the MAFFS aircraft will resume operations, officials said. The Lockheed C-130 Hercules is a four-engine turboprop military transport aircraft designed and built originally by Lockheed, now Lockheed Martin. Capable of using unprepared runways for takeoffs and landings, the C-130 was originally designed as a troop, medical evacuation, and cargo transport aircraft. 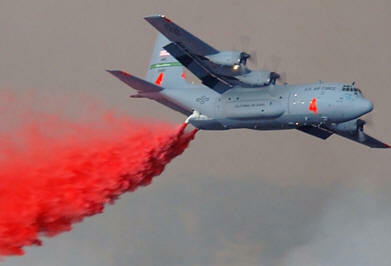 The versatile airframe has found uses in a variety of other roles, including as a gunship (AC-130), for airborne assault, search and rescue, scientific research support, weather reconnaissance, aerial refueling, maritime patrol and aerial firefighting. It is now the main tactical airlifter for many military forces worldwide. Over 40 models and variants of the Hercules serve with more than 60 nations.